Oh. Em. Gee. . . .
Why haven't I shared this with you yet?? Today I want to share with you a beautiful kitchen redesign that was completed by the talented team over at Square Footage! Square Footage Inc. is a full service interior design firm specializing in custom kitchen and bathroom renovations - and they are awesome! Seriously guys, have a look at this kitchen!! What the?!? Isn't it gorgeous!?! I absolutely LOVE the colour of the cabinetry!! Now, I can't take credit for much here, however . . . the island bar stools were all restyled at Mango Reclaimed using van Gogh liquid metal paints in a beautiful champagne colour called 'honeymoon'. I love how the painted wooden frames add a bit of soft and subtle glam to the space. The upholstery was done by the talented team over at Custom Drapery and Upholstery in Whitby. If you're in the area and have something that needs reupholstering - give them a call and ask for Judy, she's my girl! Let's look at that kitchen and those island seats again! Frankie and Laura over at Square Footage really know how to pull it all together! Ok, so the barstools aren't the only Mango Reclaimed restyled pieces in this space! Check out this gorgeous kitchen table!! This table was originally the clients but it needed a serious makeover if it was going to keep up with all the other gorgeousness! 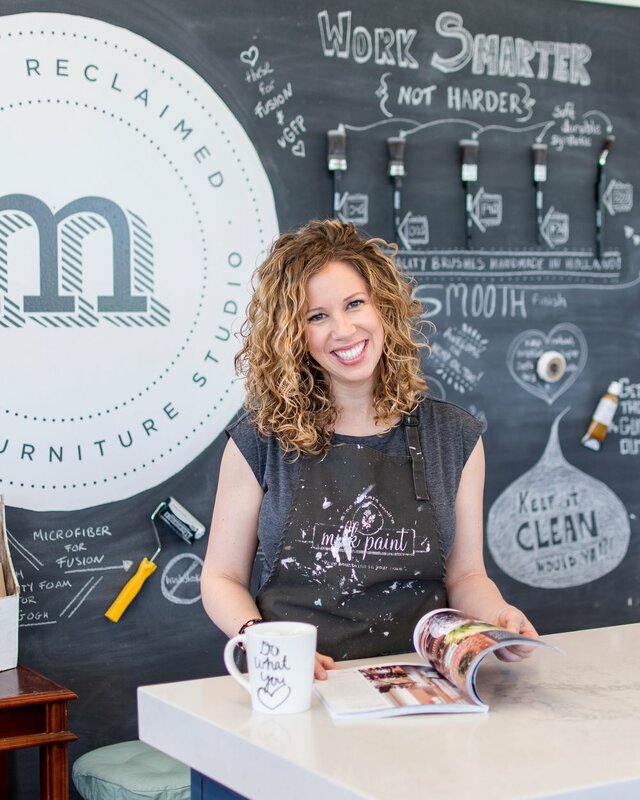 Enter Mango Reclaimed and Miss Mustard Seed's milk paint! We often get asked at the studio if we work with stains . . . did you know that milk paint can be used as a stain? That's right!! On raw wood mixed at a ratio of one part powder (paint) to 3 parts water this stuff acts like an amazing beautiful stain. The best part - it comes in soooo many pretty colours!!! Milk paint staining this table top instead of painting it right out shows off all the gorgeous grain of the wood while also complimenting the rest of the natural elements incorporated into the space. I realize that I show you lots of restyled furniture on this website / blog, but maybe it's not that easy to picture how these finished pieces will look in a finished space . . . I hope this post helps you visualize how it can all come together! Still looking for more inspiration? Follow our 'paint your furniture' board on Pinterest!